to be able to use for project scheduling, shared mailboxes and project related documents. TechShire's dedicated team of SharePoint website designers utilise SharePoint's advanced, flexible inbuilt editing capabilities to create a bespoke SharePoint site that perfectly suits your company’s requirements. Migration of existing server based data and file libraries is simple with the tools available on the SharePoint website. Data can be seamlessly copied to the SharePoint site along with any file securities and permissions. SharePoint with its huge benefits does require a certain amount of maintenance. 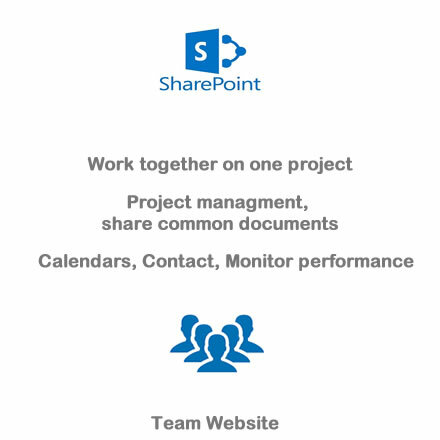 TechShire’s Support Services can be used to ensure your SharePoint site has maximum availability for a very competitive rate. There are some very useful features within the SharPoint and OneDrive environments that allow for collaborative integration. SharePoint libraries and documents can have user access restrictions placed on them to prevent unauthorized access or printing / copying. OneDrive can be used on its own by any business wishing to make use of features such as limiting access to certain users or folders but it does not have the collaborative functionality of SharePoint.